Taylor von Kriegenbergh Wins WPT Seminole Hard Rock Showdown and $1,122,340! The World Poker Tour Seminole Hard Rock Showdown concluded on Monday night in Hollywood, Florida, with Taylor von Kriegenbergh emerging as champion and claiming his first WPT title worth $1,122,340. Von Kriegenbergh won his title after defeating a final table that included Allen Bari, former WPT champion Tommy Vedes and experienced tournament player Curt Kohlberg. Coming into the final table, von Kriegenbergh had a chip lead of approximately double his closest competitor. Shortly into play, on the sixth hand, von Kriegenbergh won a seven-figure pot from Abbey Daniels to increase that lead and move over five million in chips. The first elimination didn’t come until hand No. 77 at the final table. With the blinds at 25,000/50,000 with a 5,000 ante, Kohlberg opened with a raise from middle position to 125,000. Vedes flatted out of the small blind and the two players took a heads-up flop of . Vedes checked and Kohlberg tossed out a continuation bet of 175,000. Kohlberg was faced with some heat in the form of a check-raise from Vedes to 475,000. Instead of just calling the 300,000 more, Kohlberg opted to move all-in and Vedes called to put himself at risk. Vedes held top pair and a heart draw with . Kohlberg tabled for bottom two pair. Vedes failed to find a better two pair, trips or a heart as the turn was the and the river the . Kohlberg had him covered and the 2009 WPT Festa al Lago champion was eliminated in sixth place. On the 99th hand of play, Justin Zaki raised to 135,000 from the cutoff seat with the blinds at 30,000/60,000 with a 10,000 ante. Bari reraised all-in from the small blind for 1.195 million, or just under 20 big blinds. Action got back to Zaki and he made the call after requesting an exact count. Zaki tabled and Bari . The flop, turn and river ran out to give Zaki a full house and finish off Bari in fifth place. Falling in fourth place was Daniels, the lone woman to make the money. She was all-in against Kohlberg with to Kohlberg’s pocket sixes for another race situation. The board of ran out and Kohlberg’s sixes held up. Not only did Kohlberg eliminate Daniels on the hand, but he took over the chip lead from von Kriegenbergh. While three-handed, von Kriegenbergh dropped to the bottom of the pack behind Kohlberg and Zaki. On the 185th hand of play, he had to come from behind more than just a chip deficit as he found himself all-in preflop and in very bad shape. With the blinds at 60,000/120,000 with a 20,000 ante, Zaki opened to 280,000 on the button and von Kriegenbergh reraised all-in from the small blind. Zaki quickly made the call with , crushing von Kriegenbergh’s . The board ran out though and gave von Kriegenbergh two pair to keep him alive and double him back into the pole position. From there, the three remained fairly even over the next 20 hands before von Kriegenbergh found another double-up, this time through Kohlberg. The two got all the money in on a flop with von Kriegenbergh’s out-kicking Kohlberg’s . The turn was the and the river the and once again, von Kriegenbergh used king-ten to double up. On the 212th hand, von Kriegenbergh busted Zaki in third place to take a commanding chip lead into heads-up play. 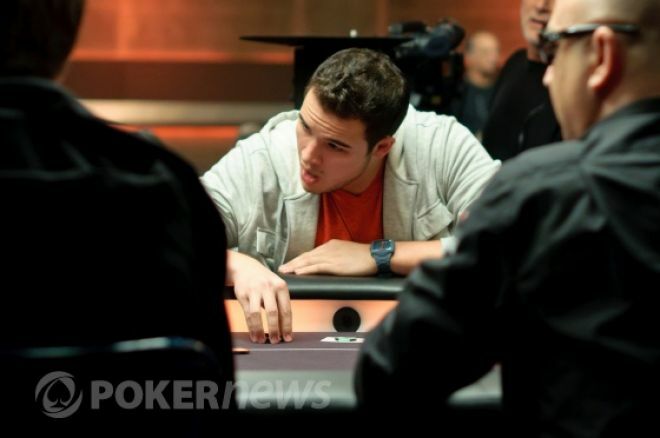 To begin the hand, von Kriegenbergh had 8.55 million in chips to Zaki’s 2.475 million and Kohlberg’s 1.95 million. Von Kriegenbergh moved all-in from the button to put the pressure on his shorter-stacked opponents with . Zaki called from the big blind with to put himself at risk. From there, the board ran out and Zaki was gone in third place. When heads-up play began, von Kriegenbergh held 11.125 million in chips to Kohlberg’s 1.85 million. The battle between the two only lasted eight hands. On hand No. 220, von Kriegenbergh moved all-in from the button and Kohlberg called with . Von Kriegenbergh held and the board ran out to give him a full house. Kohlberg was eliminated in second place as von Kriegenbergh captured the inaugural WPT Seminole Hard Rock Showdown for a whopping $1,122,340! The WPT isn’t done yet for Season IX. There is still one more event: the WPT World Championship at Bellagio in Las Vegas later this month. The event has a $25,000+500 buy-in and runs from May 14-20. You can expect to see von Kriegenbergh there, along with all other winners from this season, in one of the most elite events in poker. There will also be a $100,000 Super High Roller event May 18-19. Be sure to check back with PokerNews for recaps on both of those events. Special thanks to the WPT Live Update Team for providing live updates from this event. In the meantime, if you love poker, be sure to follow us on Twitter and like us on Facebook for up-to-the-minute poker news.